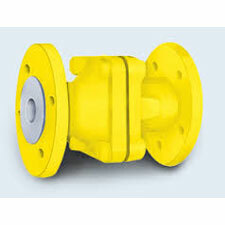 AMTECH Offers ball check valve have PFA /FEP lined as standard lining and uses the cast dovetail recesses and machined grooves to lock the liner to the body casting, to prevent flow opposite side. Amtech offers fully-lined ball check valve is now available in DIN, ASME short and standard pattern designs, and offers a flexible seat for Class A and API-598 Sealing, best-in-class for media backflow protection of processes and equipment. Amtech fully-lined products are a reliable alternative to expensive alloy valves. Lining PFA / FEP lining.